The top of line presentation bouquet , very modern and sleek for the sophisticate. 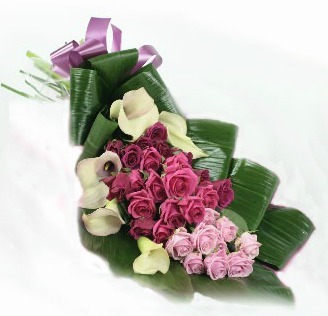 Lush calla lilies and roses are framed with folded leaves to create a stunning bow. Sized for an adult or can be made in a smaller version for a child. Very European and very classic. Modern European presentation bouquet shown app. 25″+ long. All presentation bouquets can also be made in forever silk flowers.